Address : DEPARTMENT OF ECONOMICS, DR BAM UNIVERSITY AURANGABAD 431004. M.S. 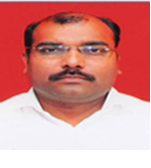 Mr. Mishra Mahendra Ph.D. Economic Analysis Of Wind Power Projects In Maharashtra State Awarded 2018 sub. Welcome to Educator and Researcher Profile Module. Copyright All Rights Reserved, Dr. Babasaheb Ambedkar Marathwada University, Aurangabad.